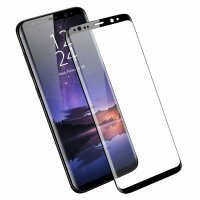 Keep your Samsung Galaxy S9's screen in pristine condition with this Olixar Tempered Glass screen protector, designed to cover and protect even the curved edges of the phone's unique display. Black edges match the phone perfectly. This glass fits really good with phone. In hand feel is super since it does not have uncomfortable edges like other covers. Also does not show so much fingerprints as other similar products. Arrived late, but was worth the wait. So easy to attach to the phone , just follow the instructions. AT LAST NO BUBBLES ON THE SCREEN. Great product. 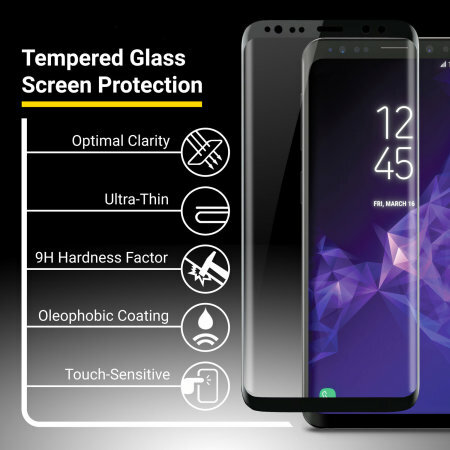 This ingenious solution to protecting your S9's screen involves a 0.33mm thick tempered glass protector that covers even the edges of the curved screen. The underside of the screen protector sits flat on the screen and follows the contours of your phone's screen perfectly. This covers the entire screen and offers complete protection. No more compromising by leaving the curved edges exposed and this also ensures no dirt will get in - so no more "halo effect".